Some dogs are just more spirited and energetic than others. But is your pooch particularly wild and high-strung? Does he jump on people, knock children over, ruin furniture, and bark at all hours? Ever found yourself complaining, My dog is out of control! Have an over-excited pooch? You can teach him to be calmer and less impulsive. Can you control an out-of-control dog? Dogs can certainly be pushy, impulsive, and impatient. It’s in their nature and they definitely have minds of their own. But sometimes, we just want to see more of their softer, more easy-going side than the crazy and uncontrollable side. More importantly, we want them to be safe. Dogs who are over-excited can sometimes put themselves in harm’s way. They may rush out of the car and into oncoming traffic, or get into fights with other dogs. They can also seriously injure small children by greeting them too enthusiastically or annoy the neighbors with their incessant barking. Like little children, dogs often “misbehave” because they can’t control themselves. And just like we teach our children the importance of being calm and patient, we can also teach our dogs how to develop self-control. It’s not something you can accomplish overnight, but if you want to keep your dog safe and if you want to be able to live harmoniously with him, this is something you’ll have to prioritize. Do you feel like your pooch is driving you to the brink of insanity? Here are some possible reasons behind your pet’s crazy activity and how you can control his behavior. There are lots of reasons for dogs behaving badly. Some may be medical, genetic, or environmental. Some may require treatment by a veterinarian. But more often than not, your pooch’s unfavorable behavior may be the result of your interactions — and may be something you can attempt to fix. Lack of exercise — If your dog is often hyperactive or over-excited, it may be because he doesn’t have an outlet for blowing off steam or excess energy. But don’t just let him loose in the yard in hopes that he’ll eventually tire himself out. Make sure he gets some directed exercise like a long walk. Lack of mental stimulation — Aside from keeping your dog physically active, you should also keep him mentally active. Stimulate his mind by playing fetch, letting him run through an obstacle course or do some dog puzzles, and having him do some obedience training. These activities can help drain his energy and calm him down. Lack of sufficient downtime — Is your dog’s nap often interrupted by little children wanting to pick him up or pat his head? If your dog isn’t getting enough time for relaxation, this may lead to him feeling unfocused and jittery. Dietary issues — Some brands of dog food are filled with carbohydrates, which provide quick bursts of energy and can make dogs hyperactive. If this is the case, you may want to switch to a brand of affordable dog food that has more protein than empty carbs. 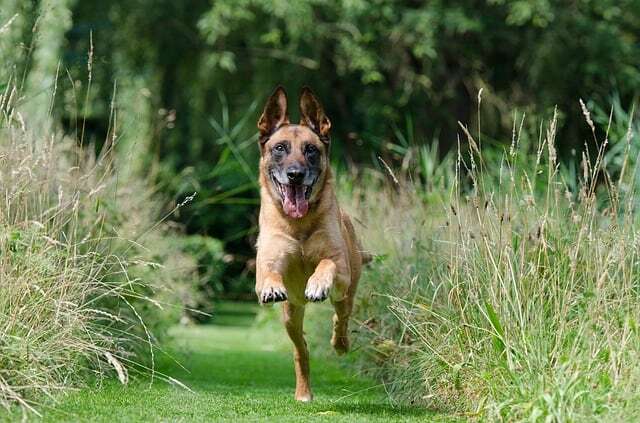 There are several reasons dogs can be hyper and run a little wild. Diet and lack of exercise are two of the most common reasons. Keep him busy — Make sure your dog gets enough physical and mental exercise every day. If he’s sufficiently tired, he won’t have enough energy to cause trouble. The Humane Society recommends long walks, interactive toys, and a good game of fetch. Don’t punish — If your goal is to teach your dog what not to do, punishing him for bad behavior by scaring or scolding him isn’t the best way. There are several reasons why punishment often backfires. First, it can damage your relationship. Second, it’s often confusing for the dog. He may misunderstand which behavior you’re punishing or why you’re punishing him. Third, punishment doesn’t teach your pooch what he should be doing. Instead of punishing your pet for misbehaving, just keep him from getting the thing he wants until he’s in a calmer mood. Reinforce good behavior — Ignore the bad; reward the good. Did he stop barking for a few seconds, pause by the door instead of rushing out into the road, or stop himself from pawing the front of your suit? Wait for the behavior that you want to see and praise or reward it. Be consistent — It may take several repetitions before he truly gets it, so it’s important that you be consistent. If you reward him when he doesn’t put his paws on the table tonight but let him do it tomorrow, he’ll be confused as to what behavior is expected of him. Follow these tips, be patient, keep at it, and you may soon be able to stop saying “my dog is out of control!” Best of luck!